After a fair amount of build-up, the Apple Watch finally graced us with its presence last year. For a product in a category that is scarcely established, let alone approaching maturity, it has sold well early on. However, like many of its counterparts, it has suffered from a perceived lack of real necessity. Consumers are interested in the smartphone because they'd struggle without it, but the same cannot be said for the vast majority of smartwatches. These things take time, of course, and it's be presumptuous to suggest the smartwatch is doomed to fail. But where devs were only too keen to build Apple Watch apps and services early on, interest appears to have sharply declined. It was almost a given that Apple Watch would sell better than the vast majority of rivalling smartwatches, and so it proved. Arguably, it's a nice-looking device, and there are plenty of customization options and bands available to suit different styles. However, aside from a few decorous features and functions, it doesn't do that much, especially given its price tag. In its relative infancy, the Apple Watch—and other devices like it—are in real danger of slipping away. According to Tim Anglade, vice president at mobile database firm Realm, developers were only too happy to build Watch apps when the wrist computer first hit the scene. 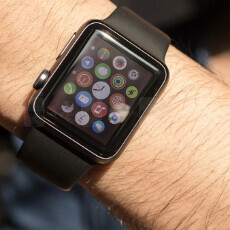 However, he now estimates that the number of new iOS apps outnumbers Watch apps by as many as 1000-to-1. Of course, given the limitations of a watch compared to a smartphone or tablet, the platforms are largely incomparable. But with Realm boasting a reach of over one billion app users through the 100,000+ devs using its database services, Anglade's words paint an ominous picture ahead of Apple's big WWDC gathering next month. Apple is expected to unveil new Watch hardware along with an improved version of the watchOS at June's dev conference ahead of a fall release. Given the apparent developer and consumer apathy towards the device and smartwatches in general—save, perhaps, the Pebble and a few popular fitness bands—Cupertino will need to unveil substantial improvements if it's to sway opinion. Do you believe the Apple Watch has a future, or should Apple be alarmed? Join in the conversation by leaving a comment below. No amount of upgrades will make these things more useful than a smartphone. It needs to fill in a very important need currently missing from smartphones before it becomes a necessity. Watches before smartwatches weren't really useful either, they were just fashion accessories. So not only do they have to find this "need" for a smartwatch, they then have to make the smartwatch amazingly good at filling that need. Spoken like someone that grew up after the invention of the cell phone. People did not always have a little computers in our pockets. There was a time we kept our appointments in little notebooks and the watch on your wrist to keep track of the time. What does that have to do with Apple Watch devs? Or are you just being an @$$hole again? It makes sense, if devs are losing interest in apple's then it's likely to be even bleaker for everyone else. 3D-hologram watches until thn i m happy with my smartphone!! Fitness band can work but not a watch man!! Could this be Apple's first true major FAIL??!!?? 60% of the smart watch market says "nope" lol. Even though Apple might have sold more watches right now. That is going to change in the future, for sure. There is a number of glaring problems with Apples watch platform. It's locked to only iPhones. Even then the iPhone 5 and above. It doesn't even support their own iPod touches or iPads. Unlike other smart watch platforms that can support iOS, Android and others including tablets as well as phones. Then the wifi is a joke on the Apple watch, plus there is no GPS. Developers have no options to make an app for the Apple watch that can communicate with anything other than what's on your iPhone. Also 3rd party apps run slow, and even though there is native watch app support since 2.0, you still need an iPhone app to do all the information gathering of data needed for the watch, so it can communicate with the outside world. Apples watch relys on their iPhone too much, and doesn't support other platforms. The other issue and it's a major issue. Apples watch fails as a watch. I know one person right now that doesn't wear their Apple Watch any more. Because the battery doesn't last that long. Plus it's watch face is off most of the time. You can't just glance down at it like a normal watch. You have to tap the screen or make the hand gesture to turn on the display for tiny bit of time. Even Apple lists their watch for 18 hours. Sure you can stretch that time out depending on usage habits and how often you use it. But at the end of the day the Apple Watch fails as an actual watch. Even other smart watches can leave their watch face on all the time. Also the author was making it sound like you have so many different options for Apples watch. There is only one square style and that is it. Oh, and the two sizes 38mm and 42mm. Sure there is different metals and colors, but at the end of the day it is still only one style. Not a fan but Samsung latest watches are way more usable and beautiful than iwatch. another click-bait article, this website is hopeless. nowhere does this article provide any comparison figure that explains the title of this article "disappearing" "However, he now estimates that the number of new iOS apps outnumbers Watch apps by as many as 1000-to-1" This website has been reduced to nothing but biased, fanboyism inciting, tabloid sponsored tech blog. seriously, PHONEARENA you need to up your standards when hiring writers. Other sites await you passionate rants. it is obvious the writer doesn't even expect you people to read the article. dear Ben R, you are an embarassment to the word journalism. he just simply came up with this bs title to start war in the comment section. Just my opinion I wear watches but it's cause I'm into fitness and since Apple does not have a GPS and isn't truly gym ready. I won't get it at all. Well besides being on Android my watch of choice is always geared towards fitness not a watch that losses value everyday passing day just to look cool and scream hey I have Apple I'm cool. This arrival and title is false. The report came out yesterday and it was about developers loosing interest until all apps can run on the watch natively without the phone. I'm really getting tired of these click bait Apple arrivals. Where is the question.about Android Wear and Tizen watches? They aren't selling at all!! Because smart watches in general are insanely overdeveloped for what they are?, pebble seems to have the right idea, keeping it clean and simple, notifications and some quick functions. What does smart watches need drawing on the screen or somesuch for? running games on the screen? why? when we've got a powerhouse of a phone in our pockets with significantly bigger screens? IF I want a watch, I will buy a real Swiss-made watch, not a crappy Apple Watch. Why is this a surprise? This is the ugliest watch on the market. People should be embarrassed wearing this pill box on their wrist. Gave mine to my wife, it's her baby now. Owned a smartwatch. New wore off in four days, quite wearing it in seven. Redundant, unnecessary, thingy!